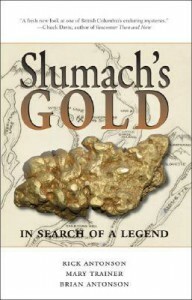 Take a trip back to the 1890s in New Westminster BC and learn about a native Canadian named John Slumach who has taunted thousands of gold seekers with the legend and curse of Slumach's hidden gold mine before being succumbed to his hanging in 1891. From there, the authors piece together information based on fabulous research of the whos, whats, wheres, and whys that keep people interested in Slumach and his so-called curse, and the quest for his hidden treasure. Local greater Vancouverites will identify all of the nooks and crannies of the Lower Mainland that are described in this book, and together all three authors used their resources to interview and research many of the who's whos in the area to get closer to the answer of not only is there in fact gold, but where is the gold. A great, quick read and very interesting to learn a little history about the Lower Mainland that many might not have heard about!